Hemp jewelry making supplies are cheap and easy to find. The natural hemp jewelry cord is the most popular. It comes in sizes ranging from 1mm to 3mm in diameter. 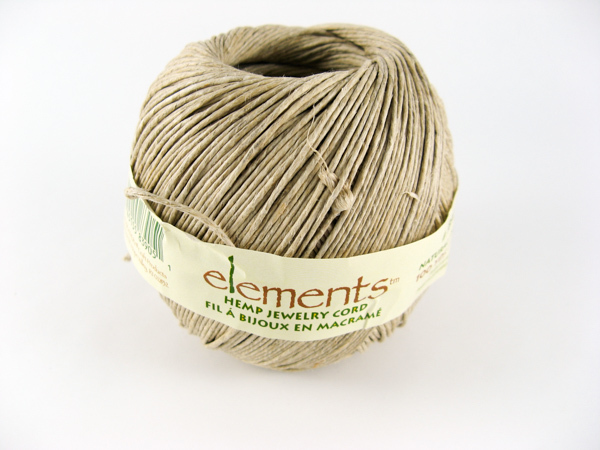 Hemp is the preferred cord for jewelry making because it's strong, knots easily and holds knots well. You don't need to use glue on your knots, but some people do. Hemp jewelry making supplies are in every craft store these days and there are lots of colors to choose from too. You can make a necklace using two different colors of hemp with or without beads. There are lots of beads available that have large enough holes to string your hemp through. Pictured here from left to right, starting with the back row we have porcelain, FIMO round clay disks, mini pony beads, frosted E-beads, and spacer beads made of polymer clay. Pony beads are the most popular hemp jewelry making beads of all. You can get them in a many sizes and colors.